Refuge in Refuse at SOMArts documents the stories, artworks, and characters that once occupied the landfill. 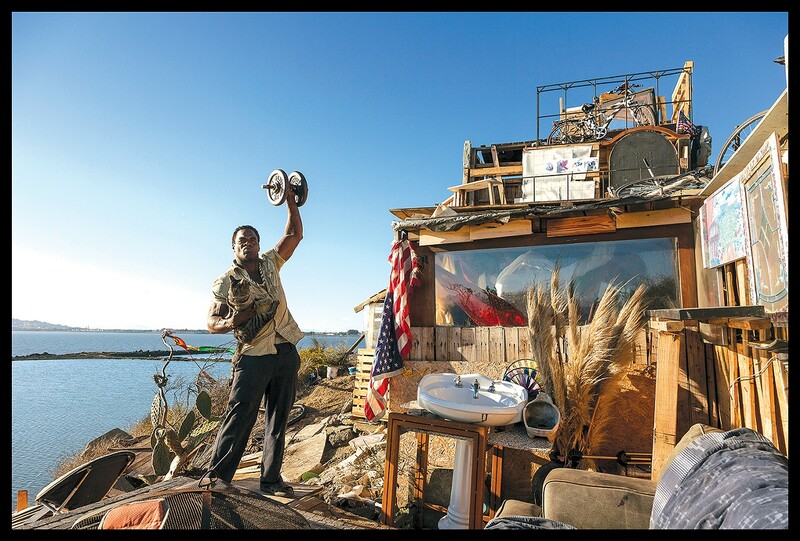 Boxer Bob's former abode on the Albany Bulb. 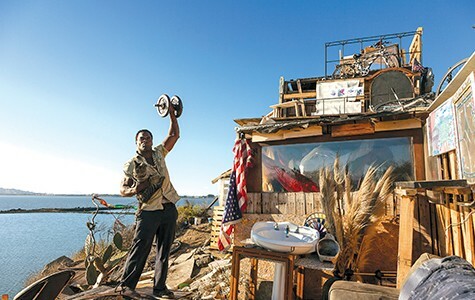 Once in a while, when the wind would pick up and begin howling at the rickety walls of his self-constructed mansion, Boxer Bob would climb onto the roof and start punching at the sky with ferocity. He was one of the many "landfillians" residing at Albany Bulb — a landfill peninsula on the waterfront — when it was evacuated last year. Before it was dismantled, Bob's mansion was among the most awe-inspiring sights of the Bulb's wild landscape. Pieced together with scraps of wood, metal, old signage, and other found materials, it stood at the edge of the bay, overlooking the water like a castle from a fable. Beyond Bob and his mansion, many other characters and creations once resided at the Bulb. It was common for Bulb residents to spend their time making art, collecting found objects, or reading books from the shared library. When concrete was left at an abandoned construction site nearby, a resident who went by Mad Marc biked back and forth, carrying concrete to a site on the Bulb, and eventually sculpted a clubhouse as a gift to the Bay Area and all of its magic. Bob, Marc, and many other former "landfillians" tell their stories in Refuge in Refuse, artist Robin Lasser's 37-minute documentary about the people who lived at Albany Bulb. In May of 2013, Bulb residents were told they had until April 2014 to relocate, as the Bulb would be transferred over to the California State Park system and policed for campers. So Lasser decided to spend nearly every day that year out on the peninsula filming and getting to know its residents. Partially, her intention was to memorialize the world constructed there — the autonomy, spontaneity, and disregard for societal norms with which the residents lived. Each member of the community maintained his or her own personal reality, playing out their fantasies and performing rituals of place-making at the Bulb. Lasser's aim was to avoid making stigmatizing assumptions or taking the distanced approach of an anthropologist. Instead, she represented the community with full respect and acknowledgment of their lives and work as not only legitimate, but beautiful. Lasser's documentary is only one aspect of a huge initiative and art show called Refuge in Refuse: Homesteading Art and Culture Project, which is now on view at SOMArts in San Francisco (934 Brannan St.). Lasser co-curated the show with Danielle Siembieda and Barbara Boissevain. The elaborate exhibition also includes artwork made by the residents, visualizations of research done on the Bulb by UC Berkeley students and professors, a handful of short films made at the Bulb at different points in its history, stunning photographs by Lasser manipulated into mandalas and zoetropes by Judith Leinen, and many other works. As part of the show, co-curator and "alter eco" artist Siembieda spearheaded a collaborative project with Lasser as well as an architectural surveying company, F3 & Associates, to create 3D scans of notable structures and sculptures on the Bulb. On February 28, from 1–3 p.m., Siembieda will be leading an augmented reality tour of the peninsula created with those images. That means when participants are touring the Bulb with their smartphones or tablets streaming the augmented reality software, they will be able to see the environment around them — captured by the camera on their devices — with the images of the since-demolished structures superimposed into the landscape where they once stood. The goal is to archive the images of the unique buildings, and explore how those images can work as aesthetic metaphors for their own paradoxical existence — simultaneously lost and remaining, like digital ghosts. Many aspects of Refuge in Refuse offer aesthetic analogy. The exhibition goes beyond documentation to show a deep thoughtfulness surrounding the spirit of the former Bulb community. Take, for instance, the signs stationed throughout the exhibit that explain the various landmarks of the Bulb through quotes by former residents. While the explanations are those of the Bulb community, the signs themselves imitate the appearance of state park signs (white writing on brown metal). Through the convergence of the two styles of representation, the curators hoped to reassign the privilege of authorized explanation to the former residents of the Bulb, legitimizing their lifestyles and community. In a sense, that's the intention of the exhibit as a whole as well. On April 25, from 1–3 p.m., the curators and public will commemorate the one-year anniversary of the eviction of the Bulb with an act of interventionist artwork by planting the signs in their original spots. By doing so, they hope to ensure that the stories of the former Bulb residents will be publicly recognized and remembered.